Sometimes the smallest tasks can take the most time. And in today’s fast-paced world, who doesn’t have a never-ending list of things to do? Wouldn’t it be great if there were a tool that could help you get all the small stuff done faster? Now there is, with the enhanced edge screen and new edge screen features—part of the most recent OS upgrade to Android 6.0 Marshmallow. 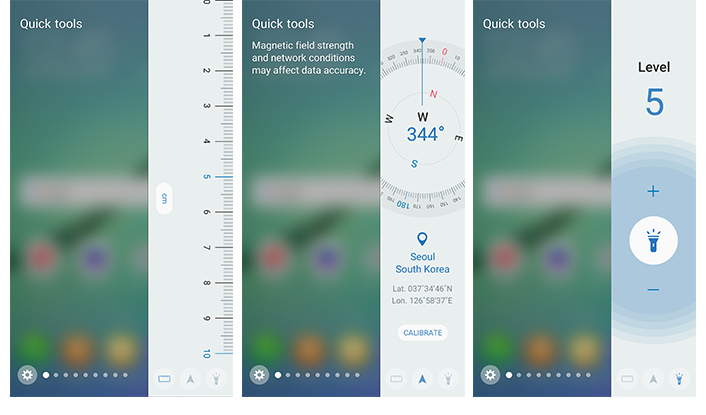 Samsung has taken the unique user interface of the beautifully curved edge screen to the next level, making it faster and more convenient than ever to perform daily tasks and get the information you need, all with a simple swipe and tap. Check out the latest updates and new features. When the dual edge screen was first introduced, it distinctly illustrated Samsung’s innovation prowess. With it, users were able to quickly connect with the most important people in their lives, and could more easily access their favorite apps all in one place. But, at 260 pixels wide, there were limitations in how much content could be displayed on the edge panel. Now, however, the company has enhanced the user experience of the edge panel by making it an option for users to widen it to an impressive 550 pixels, thus enabling more content to be displayed. This upgrade has also allowed for the addition of new features, as well as improvements of existing ones. The edge screen all but eliminates the need to navigate disorganized home screens and continuously open and close apps. One way it does this is through edge panels, quick access screens that provide shortcuts to information and tasks. Users can now customize up to nine panels, including the People edge and Apps edge panels. 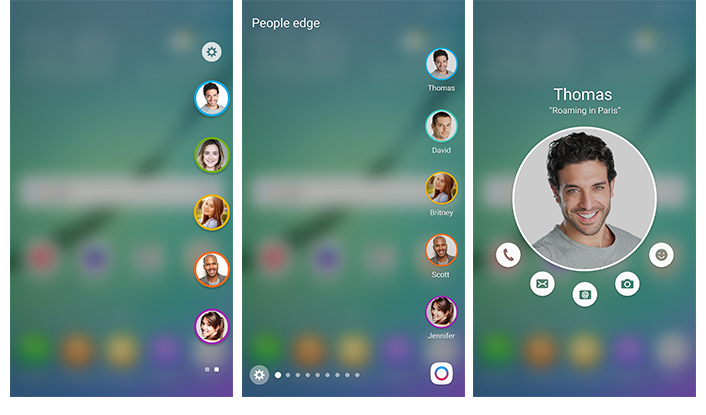 People edge lets users arrange their favorite contacts in a single easy-to-access area. Previously, the feature displayed small photo icons of the user’s top five contacts which linked to contact profiles; now, however, contact names are displayed below the photographs for a more intuitive experience. Furthermore, a shortcut to the settings menu has been included for easier navigation. Likewise, Apps edge—a panel of one’s most frequently used apps—has also been updated. 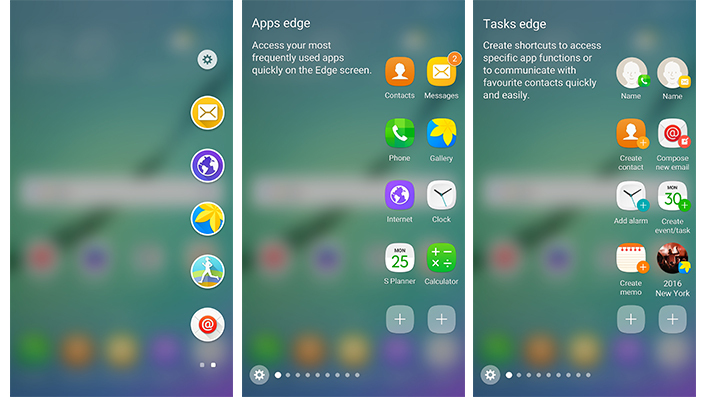 With all the expanded space of the upgraded edge panel, users can now add ten apps instead of five. In addition to single apps, users can add entire folders for maximum smartphone organization. The newly added Tasks edge panel provides shortcuts to often used app features and tasks, like creating an event in S Planner, setting an alarm or composing a text message. A brand new Quick tools, which includes a ruler, compass and customizable flashlight, has also been added in a separate panel to simplify one’s everyday life. Users can now access all these panels more easily by customizing the Edge handle—the fixed tab that opens the edge panel. All users need to do is simply adjust the place, size and transparency of the Handle in the Settings menu according to their preference. The Handle will not interfere with any apps in use, so users are free to work or play without the edge panel getting in the way. Through Samsung’s ever-growing partnerships, as well as the release of its software development kit (SDK) for the Galaxy S6 edge screen, the company has established a diverse collection of content especially for the wider edge panel. With the strengthening of this third party ecosystem, users can experience a differentiated and richer edge experience. Among the new edge content that users can download through the Settings menu is Naver Shopping, which was added in response to the growing trend of mobile shopping. And Naver V — an app that features personal video broadcasts of South Korean celebrities—is available in Asian nations where K-pop is popular. Additionally, Yahoo! 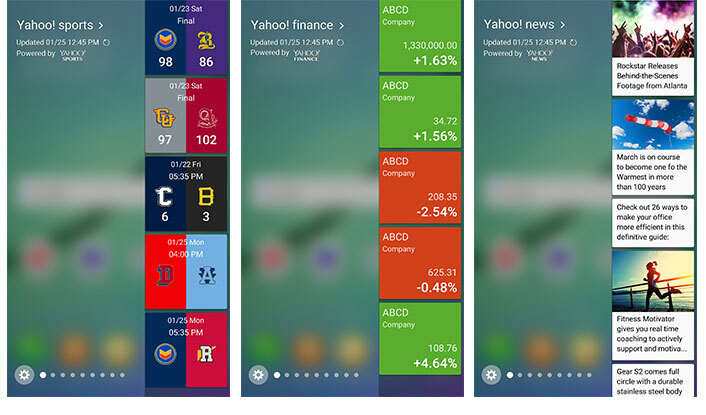 Finance, Yahoo! Sports and Yahoo! News come pre-equipped with the OS upgrade, delivering the latest stock reports, the scores of the big games and the biggest headlines right to the edge screen. 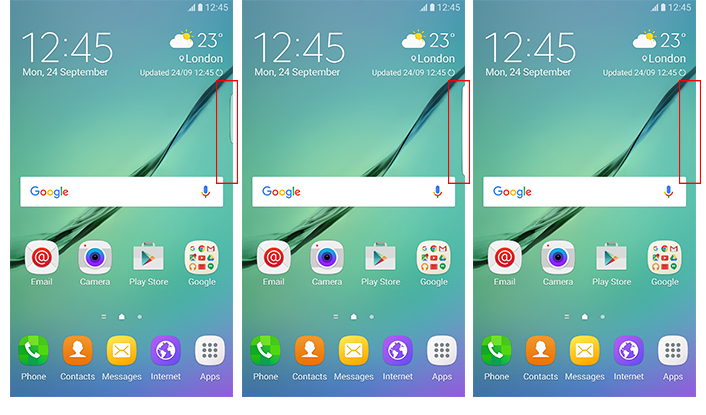 Samsung’s feature-rich edge screen display continues to push the envelope with its recent updates. But this is only a sign of what’s to come, as Samsung will continue to refine and enhance the unique edge not only on its existing devices, but also on ones to come.